As we prepare for the new year, it seems appropriate to reflect on how the use of dynamic glass has advanced throughout the past year.Dynamic glass installations have increased in size and scale, most notably in commercial office spaces, healthcare and educational facilities as well as in cultural institutions. Architects and designers are placing even more emphasis on the aesthetic appeal of SageGlass as well as its energy saving performance characteristics. As a result, the growth in our project pipeline and global order book ensures you will see a significant increase in the number of installations using SageGlass in 2017. As I write this in early December, it is exciting to report that November was yet another record-breaking month for us with regards to customer shipments. 2017 will see more records broken as SageGlass adoption grows at an even faster rate. Throughout 2016 we completed a wide variety of installations around the globe, significantly enhancing and further diversifying our installed project portfolio. Among the highlights in the U.S., SageGlass was installed at 71Above, the stunning new restaurant located on the 71st floor of the iconic U.S. Bank Tower in Los Angeles. The installation ensures the restaurant has spectacular views of the city as well as a comfortable dining experience free from the glare and heat of the California sun. Both the restaurant (and SageGlass) are earning rave reviews. In the commercial office segment of the market, we completed numerous projects that are helping enhance occupant comfort and paying dividends with improved satisfaction and productivity. SageGlass was installed at 1738 Pearl Street, a mixed-use property owned and developed by Unico Properties in downtown Boulder, Colorado. SageGlass provides occupants with a heat, light and glare controlled work environment. We also completed projects at the Advent office building in Omaha, Nebraska and the corporate headquarters for the Sukup Manufacturing Company in Iowa. SageGlass is also currently being installed in the Center for Natural Sciences, Mathematics and Nursing at Bowie State University, part of the Maryland state university system. This impressive STEM academic facility and classroom features over 25,000 square feet of SageGlass. In addition to the façade, SageGlass is also featured in the rounded “icon,” the building’s signature design element. Not all of our installations are large or iconic. At the Moore Recreation and Aquatic Center in Oklahoma, SageGlass was installed to help the community rebuild and regain its strength following a devastating tornado in 2013 and in our home state of Minnesota, we proudly installed SageGlass at the Minneapolis-St. Paul International Airport for the second time. Along with the many completed installations, we announced several major projects that will feature SageGlass. These include Mystic Lake Center, which broke ground on a 70,000-square-foot meeting facility and 180-room hotel tower attached to the Mystic Lake Casino Hotel; a 50,000 square foot project at 3.0 University Place in the “University City” district of Philadelphia; a 14,000 square foot installation at United Technologies Industries new state-of- the-art building in Palm Beach Gardens, Florida. In addition, SCHEELS, the rapidly growing sports and entertainment retailer with 26 stores nationally, is using SageGlass on their latest superstore in Johnstown, Colorado. 2016 also saw the fruits of our endeavors across Europe, the Middle East and China with many new installations as well as the creation of a very healthy pipeline of projects for 2017 and early 2018. The Bellavista Eye Clinic in Switzerland demonstrates the benefits that dynamic glass can bring to a healthcare environment, improving the patient experience and outcomes. The intensity of heat, blinding glare and a real desire to use innovative products has made the Middle East a rapidly growing market for us. Early in 2016 we installed SageGlass at the Swiss International Scientific School in Dubai, helping to keep the students and faculty comfortable all day. This was followed within weeks by the second order for the same facility – a true example of a customer immediately experiencing and appreciating the value of SageGlass. The strength of Saint-Gobain’s glass activities in Asia ensured that we enhanced the SageGlass footprint in the region by being selected as the glazing provider for the huge skylights on the new Beijing headquarters of Tencent Holdings. Tencent, meaning "soaring information" in Chinese, provides media, entertainment, internet and mobile phone services to over 800 million users. Thanks to the efforts of our teams around the world, 2016 was yet another award-winning year. 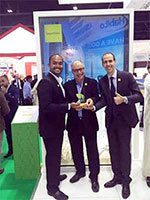 In November, SageGlass won the Gaia award for the most innovative green construction product in the Middle East at the Big 5 conference in Dubai. Selected by a panel of industry experts, SageGlass was recognized for its ability to reduce energy consumption by 20 percent and contribute to LEED certification. We were also recognized with Commercial Architecture magazine’s Dynamic Glass Product of the Year award; Building Design + Construction magazine’s Top 101 Products award; USGlass magazine’s Green Design award and the magazine’s Reader’s Choice award in the electrochromic glass category. Our website, re-launched in May, won honors for Best in Show in the Website Features-Home Page category at the 2016 W3 Awards and also won a Gold Award in the General Websites-Construction category. As in previous years, we had a strong presence at both the American Institute of Architect’s national convention and at Greenbuild. At AIA, we used our branded “street team” and chalk street-signage to direct the more than 20,000 visitors to the SageGlass cube. At Greenbuild, visitors to the SageGlass cube experienced our “hot or not” concept where half of our cube was in full-tint mode and the other half in clear state, allowing visitors to truly “feel” the benefits of dynamic glass. 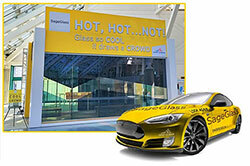 Visitors also took a free ride to the SageGlass-equipped 71Above restaurant in our “one of a kind” branded Tesla’s. Outside of North America, we were present at a wide variety of shows and conferences in Europe and the Middle East. These included Glasstec in Duesseldorf, Future Office in Munich, The Big5 in Dubai and Equipbaie and Actionaria in France. In 2017 we will be present at BAU and Batimat amongst others. In December, I had the honor of presenting at the prestigious “Glass Supper” in London. Over 300 industry-leading architects and façade specialists watched as I “pretended” I’d forgotten my presentation notes and dashed out of the hall to gasps from the audience. Seconds later the presentation screen came to life and showed the pre-shot video of me racing across London to retrieve my notes from the Saint-Gobain Innovation Center. My parkour skills haven’t quite gone viral on YouTube – but I’m still hopeful. It has been another busy year for the SageGlass team – but then, it always is. It is rewarding to look back on the progress we’ve made and to see dynamic glass become accepted as the preferred glazing solution for so many exciting projects around the globe. Happy holidays to all.